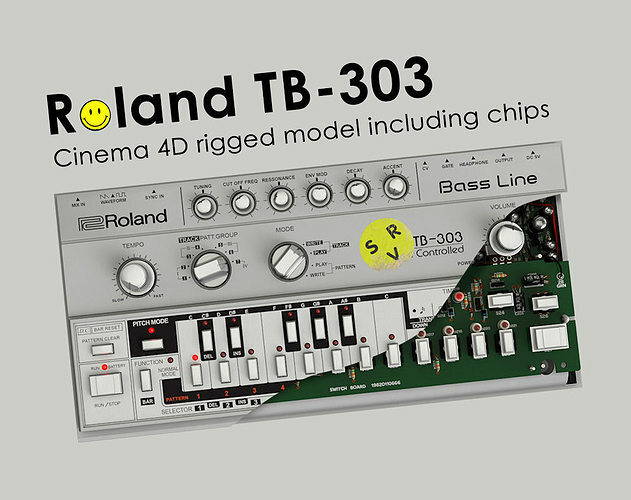 The legendary TB-303. If you like acid you know it! Note: Model made in Cinema 4D R16. 3ds and fbx file - export from Cinema 4D, not texturing. Textures in tex.rar. upd: 19\06\2016 update tex.rar . Correct (knobs1.png) . My Bad not ReSSonance - Resonance. Thank you Gianfranco. Check the mail. DFX file send. Send you a next mail with fonts and textres in (ai. psd.). DXF export option C4D. Thank you for find my mistake in "reSSonance". Update texture archiv. Hi! Model in real world size. Dimension take from Owner's Manual. 300(W) x 55(H) x 146(D)mm (11.8" x 2.17" x 5.75").